Italicized font represents information to be shared orally or physically completed with the students at this time. Non-italicized font represents additional information included to support the teacher’s understanding of the content being introduced within the CELL. Remind students that forensic chemists analyze evidence from crime scenes. After identifying and characterizing things like paint chips, blood, glass, and hair (among others), they give expert testimony in court that helps the jury determine a verdict. Note: These questions are located in students’ SDRs at the beginning and end of the Investigation. Note: These are succinct responses to the Focus Questions and are placed here for your reference at this time. Fully developed responses to the Focus Questions can be found on the PostLab page. In a chemical reaction, the chemical bonds that hold the atoms of the reactants together are broken and reformed in a different arrangement to form the products. When all of the reactants are consumed, all the atoms originally found in the reactants can now be found in the products. The observation that all the matter of the reactants is converted into the matter of the products is referred to as the Law of Conservation of Matter. If more of one reactant is present compared to the other, the reactant present in the lesser amount is completely consumed in the reaction, and the reaction stops. Note: These concepts are integrated into the Background(s) and are used to deepen students’ comprehension of the big ideas. The following list includes Key Terms that are introduced in the Investigation Background(s). They should be used, as appropriate, by teachers and students during everyday classroom discourse. Note: Definitions to these terms can be found on the Introduction page to the CELL. Inform students that the following chemical equation describes the reaction that they will analyze in this Investigation. To aid students’ understanding, write the equation on the board. Direct students’ attention to the fact that for every atom of magnesium metal that is consumed as a reactant, 2 molecules of HCl are consumed. This ratio of the two reactants produces one molecule of each of the two products, MgCl2 and H2. Assess students’ prior knowledge and their understanding of the Background by asking them to predict the answers to the following questions. Are the reactants always completely used up in a chemical reaction? Does the matter making up the reactants disappear? 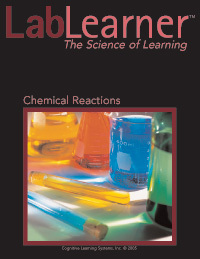 What happens if there is more of one reactant than the other reactant? How do you know when a chemical reaction has stopped? Note: Students will formulate answers to these questions after they have completed the Investigation. Explain to students that in this Investigation, they will investigate how the amount of each reactant affects the amount of the products that are produced. Play the video below. Stop to ask students questions or answer students’ questions when necessary. Remind students to follow along with their SDRs and make any notes that they think might be helpful. After the video, direct students to divide into their lab groups to discuss their strategy for the lab. For example, they may assign certain group members to perform specific functions during the lab. Note: The purpose of the video is to allow students to anticipate the laboratory experience they will soon encounter. Students should leave this PreLab session with a firm idea of what to expect and how to perform in the lab. Note: Homework is posted below the video. Tell students that they should review the Investigation in preparation for the Lab.